Struggling with picky eating as an adult? You're not alone. 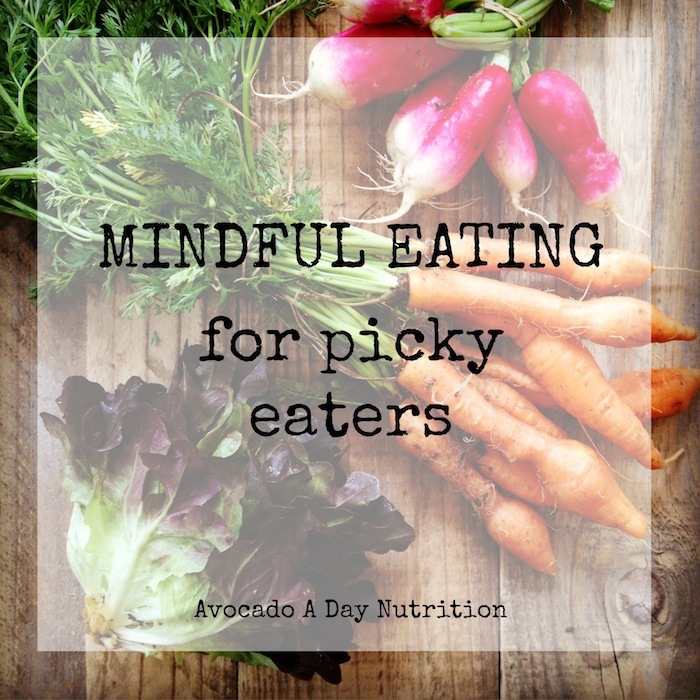 Read on to learn how mindful eating can help. Most people think of picky eating as a "kid problem." I just googled it and had to scroll through 3 pages of results geared towards parents before I got to this Wall Street Journal article, aptly named 'No Age Limit on Picky Eating.' Let me assure you, as a dietitian mainly working with adults, it's a big kid problem too. And a common one at that. I was reminded of this fact this past weekend, which we spent in Nashville visiting a few of our dearest friends. One of those friends is a self-described picky eater. The two of us often joke about it, but the fact is she wants to eat healthier. She just really, really, really does not like vegetables. Over a yummy lunch of pizza and local IPAs, she told me about everything she's done to try and get herself to like vegetables - hiding them in dishes, recreating favorite dishes with vegetables, forcing them down. She also pointed out a few odd things about her picking eating, like how she could enjoy a vegetable in one dish, but not in another. Or how when she travels, she'll eat (and totally enjoy!) many of the vegetables she does not like at home, especially if they're worked into local specialties. I'll give you the same bit of advice I gave her. It sounds counterintuitive. Why on earth would you let your tastebuds linger over something you know you don't like? Figuring out the least intolerable way to choke it down seems much more rational! The problem with that approach is that you're going into it with the expectation of not liking it, just hoping for a pleasant surprise. But if you've already got it in your head that you won't like it, guess what? You won't like it! Another common approach is to hide a vegetable in something you do like, but inevitably, you'll start comparing it to the original. You'll probably decide you don't like it, not because it tastes bad, but because it's not as good as the original. The trick is to try a new food with a curious mindset, thinking of it as an eating experience. That's why my friend has an easier time eating vegetables when she travels, because she's curious about trying another cultures cuisine. Slow down, fully experience the taste, aromas, and textures of the food. You may be surprised to realize that you actually enjoy it! In most cases, people don't dislike a food because of it's actual taste or texture, but because they have it engrained in their head that they don't like it. However, after tasting it mindfully, you might realized you really don't enjoy it. That's okay! We don't have to like everything! I despise red apples, papaya and underripe tomatoes, and probably always will! But using this mindset with recipes that intrigued me, I've developed a passion for foods I previously hated - cauliflower, zucchini and brown rice to name a few. Go ahead picky eaters, give it a try! Slow down, take a deep breath, engage your senses, and discover a newfound love of broccoli!